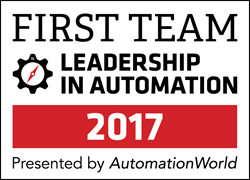 PMMI Media Group’s Automation World magazine has announced the First Team category leaders in the 2017 Leadership in Automation Program. Automation World, the leading business magazine serving automation professionals, launched this community-based program in January 2017. Automation professionals were invited to vote for their favorite automation vendors in unaided-recall surveys. Over two dozen categories are featured, representing the wide variety of automation technologies, software and products in use by today’s manufacturing professionals across the discrete, batch and continuous process manufacturing industries. Kurt Belisle, Publisher of Automation World, shares his enthusiasm. “We’re pleased to recognize the First Team Honorees who offer both excellent customer service and best-in-class product innovation. We appreciate the end-users who took the time to vote for their favorite solution providers. Congratulations to the honorees!” Leadership in Automation First Team Honorees are recognized in Automation World’s January 2018 issue, available here: http://www.automationworld.com.